If you can call it entertaining, you're more than justified in calling it good. This, at least, is how someone like yours truly feels when it comes to "National Treasure," a sleeper hit that has endured so much critical backlash since its release in November that one almost feels guilty in disagreeing with the consensus. The audience, on the other hand, seems to have seen a different film than what the paid professionals have: an action vehicle that on one hand is very silly, and on the other is extremely effective in conveying the sheer thrill of its wacky situations (and judging by the box office success, one would also argue that it's probably worth repeat viewings). For fairness sakes (and for the basic fact that I simply enjoyed what I was seeing), I am obliged to leave all points of cynicism out of this review. Few can argue that John Turteltaub's ambitious vehicle is about as unbelievable as a film can get, but if one is able to leave all sense of logic at the door, it's also very hard not to have a darn good time in the process. Shamelessly styled after the successful history-as-a-treasure-map approach that is utilized in the novel "The Da Vinci Code," the movie is wall-to-wall mystery and intrigue, with an Indiana Jones-like protagonist at the center whose own motivation isn't as much about fortune and glory as it is about family legacy. His is a tale that demands more than a standard physical agility or basic cultural knowledge to stay afloat; no, it also requires both an extensive insight into specifics as well as a sense of patience. At the beginning of the movie, young Ben Gates is told enigmatically by his grandfather John Adams (Christopher Plummer) that their family has inherited a hidden legacy passed down by the forefathers of the country. Apparently, the last surviving signer of the Declaration of Independence knew of a series of secret codes buried in government documents that would lead someone to the location of a great ancient treasure - and that knowledge, it is assumed, was passed down quite inadvertently to a member of the Gates clan. For generations, he admits, the men of their family have searched long and hard for this supposed ancient treasure but have always come up empty-handed. Recent example: Ben's own father Patrick (Jon Voight), who has grown so impatient by the search that he no longer believes in the legend; it now just an assumption that the whole thing was invented to keep fool-hearted people like himself occupied. Ben, on the other hand, believes his grandfather's assertions without any sort of challenge, and lays claim to the treasure himself for when he is older and wiser. Flash forward several years. Ben (now played by Nicholas Cage) is off scouring the arctic, looking for a famous lost ship frozen in the ice that may (or may not) harbor the notorious treasure that has eluded so many people over so many centuries. His partners, Ian (Sean Bean) and Riley (Justin Bartha), appear as if they are just there for the sake of keeping each other company, but the fact remains that Ben has, in just a couple of short movie minutes, already gotten closer to the treasure than any of his predecessors, and once their guide actually locates what he came for, their eyes light up as if all of their dreams have been realized. Unfortunately, the ship they find doesn't actually harbor the treasure itself as they had hoped - actually, all it contains is another clue, which predictably leads them into an entirely new direction. The movie doesn't take long to indicate that this is a repeating offense, either; locations change and new clues pop up so often that it becomes the picture's central gimmick, and the treasure itself isn't so much a climax as it is an epilogue to countless exhausting journeys across the globe. The primary plot device is focused on that first riddle found in the arctic; through a careful study of the words scribbled on a sheet of paper, Ben comes to the realization that a treasure map, revealing the location of what he so desires, may have been scrawled in invisible ink on the back of the Declaration of Independence itself. But considering the precious nature of that government document, he also doesn't want to risk stealing it either, especially considering how rough it would be to do so (not to mention the possible repercussions that would result). Needless to say, his comrade Ian strongly disagrees with that assertion, and in a mad act of greed he sabotages both Ben and Riley and decides to orchestrate his own plan for stealing the document, cutting them out entirely of the potential payoff. What would a good adventurer be, however, if he just stood idly by and watched a new foe try to steal something so big from underneath him? The heroes conform to the notion that the only plausible scenario in this case (both to find the treasure as well as protect the Declaration of Independence from potential harm) is to steal it for themselves. That is not a plan, mind you, that they share openly with government employee Abigail Chase (Diane Kruger), whom they meet with early on after Ian's betrayal to explain the situation. Ah, but she's a lot smarter than either of them realize, too, and though the plot to steal such a precious artifact is far-fetched to begin with considering the amount of security involved, she reassesses the situation when she spots Ben at the public archive during a private party one evening, believing he is the one behind the possible heist which he warned her about earlier. By the time is all said and done, though, her conclusion arrives too late and the document is seized from its casing. It certainly doesn't stop her from purposely interjecting herself into their plans (hey, would you leave an artifact like that with the thieves? ), but after a few good run-ins with the determined Ian and his posse of thugs, her dilemma becomes not how to get the document back, but who to trust more in handling it outside of the archives. This is a story arc that requires several more paragraphs for a thorough explanation, but part of "National Treasure's" undeniable charm is that it doesn't want to stay on any specific plot point; instead, it just creates new challenges after pre-existing ones are resolved. The script's utilization of elaborate puzzle pieces is generally clever, even though no one with any extensive historical knowledge in the real world could ever hope to solve some of these riddles that are thrown around. But the film isn't about us believing those details; it is about characters that accept them for themselves, and become immersed in all sorts of globe-trotting mischief as a result. In that regard, Turteltaub's picture is both engaging and zealous, fueled by a constant rush of adrenaline that, despite going occasionally over-the-top, seldom forgets to deliver a satisfactory payoff. Having said that, the movie is also short on big action sequences, and though some would consider that a severe misstep for something as high-spirited as this, I found it to be rather refreshing. The real excitement here is in watching two competing factions play cat-and-mouse with each other as they inch closer towards finding the lost treasure. Call me a primitive thinker, but a good clean chase scene on foot is much more amusing than a bunch of car crashes and explosions. If I hesitate in giving the film better marks, it's just because, as earlier suggested, the sheer silliness of the material leaves no room for the endeavor to resonate beyond cheap thrills. It's entirely hokey. And yet cheap thrills are thrills all the same, so it is also impossible to say that the movie is disposable, too. Part of the stigma associated with "National Treasure's" critics, in fact, may simply come down to the notion that no one is in the mood for those kinds of cheap thrills right now, especially with the onslaught of serious-themed awards contenders that tend to fill theaters in the last two months of a year. Would they enjoy the picture if it were released during the summer months instead? Perhaps. 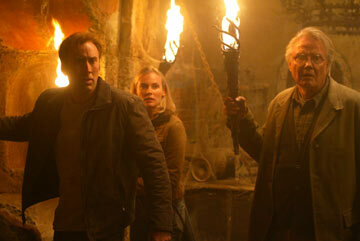 But in either case, it's the audience who has ultimately spoken in favor of "National Treasure." And in this particular instance, that's a majority rule I am contented to be a part of.